Along with all metals, lead prices too have been rising. From around $1200 per tonne in April this year, lead prices are at $2300 per tonne now. While in most cases, rise in raw material prices has a negative impact on operating profit margins, in ARBL’s case, it works differently. Typically, battery prices for OE (Original Equipment) customers are raised in line with the increase in raw material prices on the London Metal Exchange. But, the lead price reflects in the company’s material consumption with a 60 to 70 day lag. 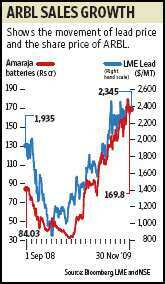 According to K. Suresh, chief financial officer: “ARBL, lead prices will hover around $2200-$2400 for the next four months. This means that the OPM cushion on account of the time-lag during escalating lead prices will not be available during the second half of FY10. The OPM could settle at more reasonable levels of around 17-18%." For the first half of the fiscal year, while ARBL’s topline grew barely by 2% to around Rs667 crore, its net profit shot up by 161% to Rs90 crore, when compared to the year ago period. Another factor that could contain the growth rate in revenues and profits during the second half are the uncertainties in the telecom segment. ARBL, a pioneer in valve-regulated lead acid batteries (VRLA) has a 35% share of the telecom market, where profit margins are higher than in the auto segment. The tariff war among telecom companies and consequent deferment of some telecom players expansion plans, deferral of BSNL Ltd’s mega tender for GSM networks and the lower than expected spend in rural network expansion bring uncertainties for ARBL’s business in the telecom space too. In fact, the company has historically posted nearly a 50% compounded annual growth rate in the industrial batteries space (of which telecom is a part) in the last four years. Nonetheless, analysts expect the automotive segment to be buoyant. The company is operating at 80% of its installed capacity of 4.2 million units per annum in this segment. Besides, it is expanding the two-wheeler battery capacity from 1.8 to 2.4 million units by the first quarter of FY11. ARBL’s revenues accrue almost equally from the automotive and the industrial batteries segment. It prefers to grow its share of automotive after-market when compared to the OE segment, where profit margins are thin. Analysts state that while the after-market margins are anywhere between 15-22%, the margins in the auto OE supplies are as low as 6-7%. For the full year, ARBL’s revenues will rise by around 20%. Yet, on the back of its stellar performance during the first half of FY10, the full year earnings per share is expected to be around Rs12. Given the share price of Rs170, the share is fairly priced with not much upside over the next six months.